Today it's one of the best things to do when visiting Darjeeling. The train route runs for 80 kilometers (50 miles) from New Jalpaiguri, in the state of West Bengal, to Darjeeling via Siliguri, Kurseong, and Ghoom. Ghoom, at an altitude of 7,400 feet above sea level, is the highest point on the route. The railway line climbs up steeply through a number of fascinating reverses and loops. One of the most scenic of these is Batasia Loop, between Ghoom and Darjeeling, which provides a panoramic view of Darjeeling perched on the hill and Mount Kanchenjunga in the background. The train also passes over five major, and nearly 500 minor, bridges. 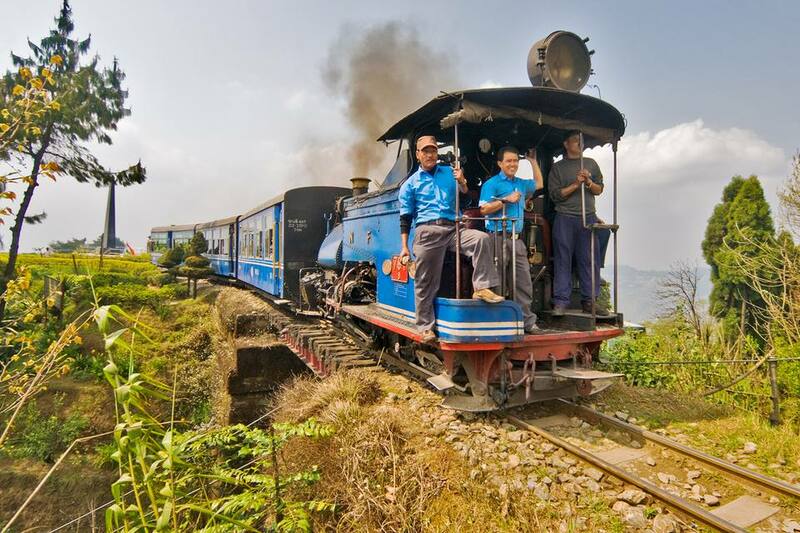 Daily Toy Train Services -- historic diesel and 'B' Class steam locomotives with various combinations of first and second class carriages, which run all the way from New Jalpaiguri to Darjeeling. Joy Rides -- Diesel and 'B' Class steam locomotives that take passengers on short trips from Darjeeling to Ghoom return. The joyride includes a 10 minute stop at Batasia loop and 30 minute stop at Ghoom Railway Museum. Jungle Safari Holiday Trains -- locomotives which run from Siliguri to Tindharia return, with the highlights being views of the picturesque Mahananda Wildlife Sanctuary and "Z" reverses (where the train zigzags forwards and backward up the slope). The main daily toy train service to Darjeeling departs from New Jalpaiguri at 8.30 a.m. and arrives at 4 p.m. (see train details and timetable). There's also a service departing from Kurseong to Darjeeling at 7 a.m. and arriving at 9.55 a.m. (see train details and timetable), and another departing at 3 p.m and arriving at 5.50 p.m. (see train details and timetable). There are four Dareeling-Ghoom joyride services. The first service, which departs Darjeeling at 8 a.m. and returns at 10 a.m., is pulled by a diesel engine (see train details and timetable). Steam engines are used for the other three joyrides. The first of these departs Darjeeling daily at 10.40 a.m. and returns at 12.40 p.m. (see train details and timetable). There is another departure at 1.20 p.m. (see train details and timetable) and the last service departs Darjeeling at 4.05 p.m. (see train details and timetable). The 52559/Jungle Safari train departs daily from Siliguri at 10.30 a.m. and arrives back at 1.35 p.m. (see timetable). Do check to see if train services are running during the monsoon season. They are often suspended due to the rain. Ticket prices for the the Darjeeling-Ghoom joyride were increased substantially in February 2015. In a steam engine train, the joyride costs 1,065 rupees for a first-class ticket -- some would say it's overpriced. Joyrides in a diesel engine train cost 695 rupees in first class. The entry fee to Ghoom Railway Museum is included in these fares. Unreserved tickets cost 5 rupees. Tickets for the Jungle Safari cost 595 rupees. If you want to take the toy train all the way from New Jalpaiguri to Darjeeling, the cost is 365 rupees in first class. Reservations for travel on the toy train (both daily services and joyrides) can be made at Indian Railways computerized reservation counters, or on the Indian Railways website. It's advisable to book in advance, as the trains fill up quickly. Here's how to make a reservation on the Indian Railways website. The station code for New Jalpaiguri is NJP, and Darjeeling DJ. For joyrides from Darjeeling you'll have to book with DJ as the "From" station and DJR as the "To" station. Tickets for the Jungle Safari holiday trains are available at Siliguri Junction Station. Phone: (91) 353-2517246.